If you enjoy walking through older cemeteries as much as I do, you might have noticed some beautiful, but different looking grave markers. These markers have a blue-gray color and even though most of these monuments date back to the last half of the 19th century, they have not weathered at all. Their lines and edges are still sharp and the inscriptions remain very legible. What is so special about the markers? They are made of metal. 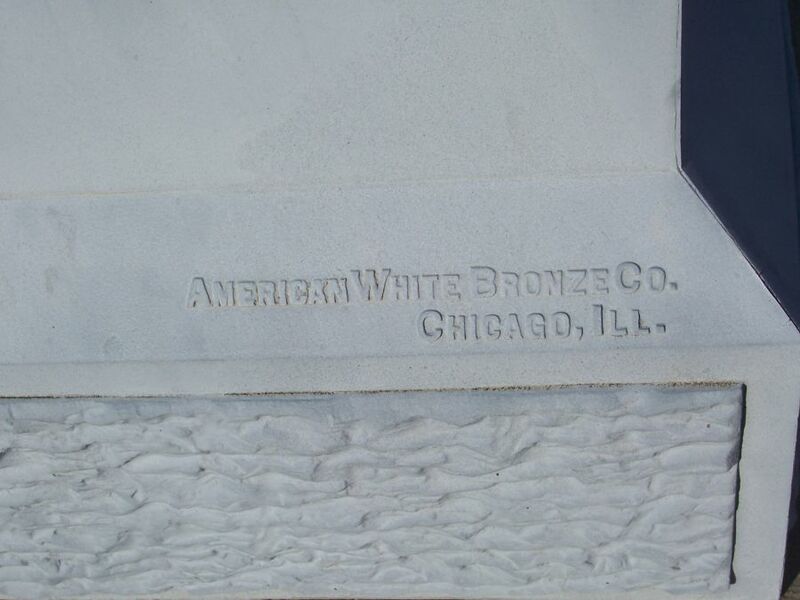 They are sometimes referred to as “white bronze” markers, but they are actually made of cast zinc. They get their blue-gray color from exposure to the elements, which forms a layer of zinc carbonate. Otherwise they withstand the weather because zinc does not corrode or rust. If fact many of the metal markers hold up much better than their concrete bases. If you are not sure if a marker is iron or zinc, try using a magnet. Zinc not magnetic and will not attract the magnet. 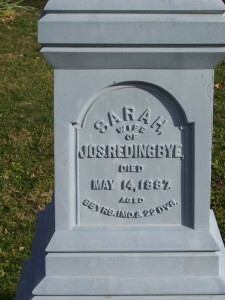 Zinc grave markers were first made in 1873 and a year later The Monumental Bronze Company in Bridgeport, Connecticut, was formed and produced them for sale. The company had subsidiaries in Chicago, Detroit, Des Moines, Philadelphia, New Orleans and St. Thomas in Ontario, Canada. The zinc markers were ordered through the company’s catalog and sold by a company sales agent. The casting was done in Bridgeport while some of the assembly was done in other areas. These metal markers were made to order, made to the customer’s specifications. The customer chose a basic design and size from the catalog and plaster molds were created from wax models. Panels and individual pieces were cast from the plaster molds. 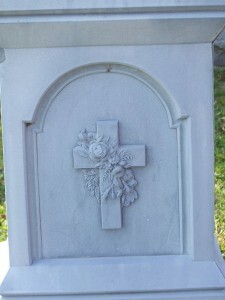 The individual panels were then assembled to make a custom monument. Molten zinc was poured into the joints between the sides and panels, which fused the pieces securely together. The photo below shows a decorative panel insert. The customer could also order specific decorations and embellishments from the company’s catalog. Some of these zinc markers are very elaborate, while others quite simple. The Monumental Bronze Co. Catalog, circa 1890, is on-line in PDF format. 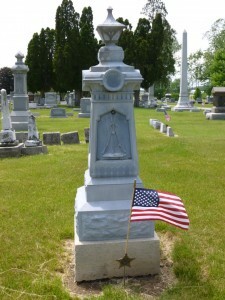 I recognize many of the markers, toppers and embellishments that we have seen in numerous cemeteries we have visited. Zinc markers were relatively inexpensive and cost less than the carved marble and granite tombstones. There are only a couple disadvantages to these markers. Zinc is brittle and can break if hit by something such as a tree branch. These monuments are hollow inside and unsupported weight at the top may cause the marker to “creep” down. 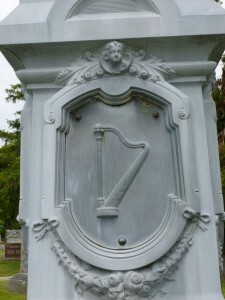 For example, the weight of a statue may cause the lower part of the monument to buckle and the statue may begin to lean. 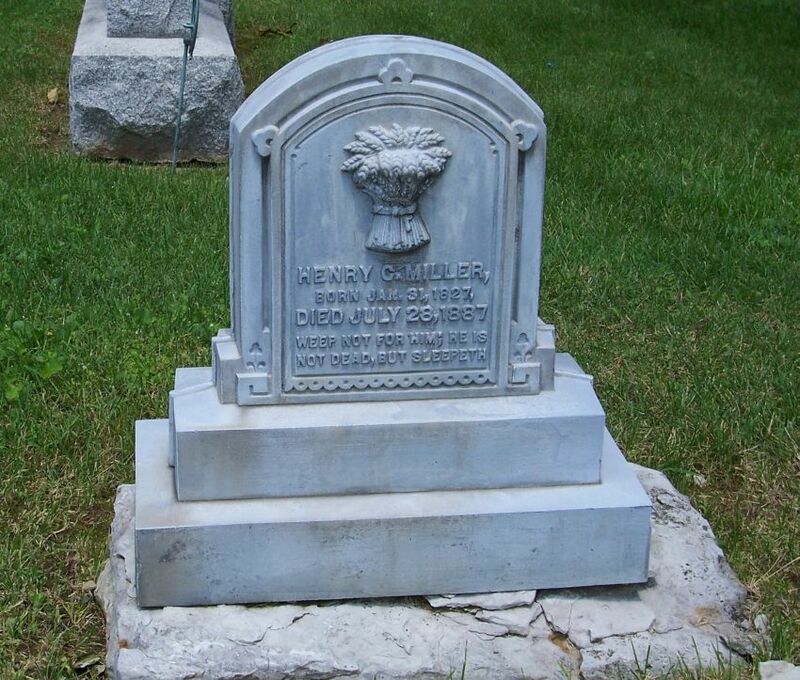 The Monumental Bronze Company ceased production of zinc grave markers in 1914 when they began manufacturing munitions for the government during WWI. They continued casting metal moldings until their bankruptcy in 1939. They continued to make inscription plates after the company ceased monument production in 1914. So you may see a zinc marker with an inscription date after the factory closed. I have noticed that these markers were used for many civil War veterans as well as many of the Civil War statues seen in cemeteries. Interesting that they never switched to zinc plating or galvanizing. Zinc is still the main rust preventing coating for fence (chain link or highway grade field fence) and other iron products exposed to heavy corrosion. Apparently it took a while to learn that it was too brittle for stand alone applications. My name is Brian. I own Guiot Cmetery Monument Company in West Warwick, Rhode Island. I have several photographs of zink monuments in my collection. 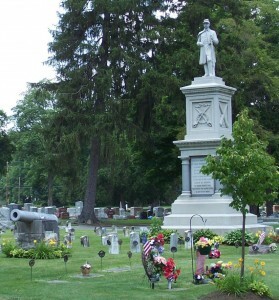 I am also the monument officer for the Sons of Union Veterans of the Civil War organization. 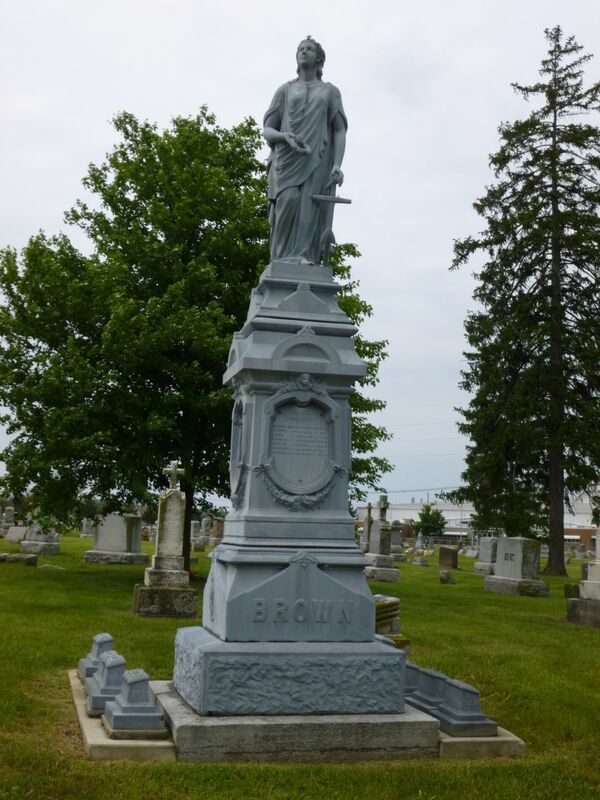 I have been writing stories for our website about Westerly, RI granite and The Gorham Company of Providence Rhode Island who made the bronze work for many of the old Civil War monuments here in Rhode Island and at many battlefields. These two companies made a lot of monuments for the Rhode Island Civil War Soldiers also. Now I want to write about zink monuments for our organization and I don’t really know much about the zink monuments. I just read your site and I learned something today! 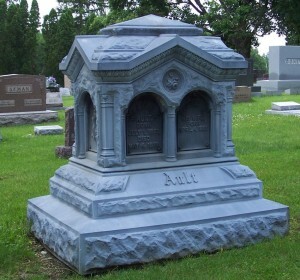 I was pleased to see a site about zink monuments! Can you tell me anything that ( GAR) Grand Army of the Republic organization, Civil War veterans organization if they purchased any zink monuments for any old battlefields etc.? The government back in the day made many marble monuments for the veteran’s graves, but now they are in tough shape. Some of them, you can hardly read the inscriptions. I have replaced many of them with Barre Vermont gray granite. I really like the zink monuments, they are works of art in my opinion! Please, give me your email address and I will send you some beautiful zink monuments located in Rhode Island cemeteries for your collection. I do hope to hear from you. Respectfully I am, Brian Guiot Have a wonderful day! 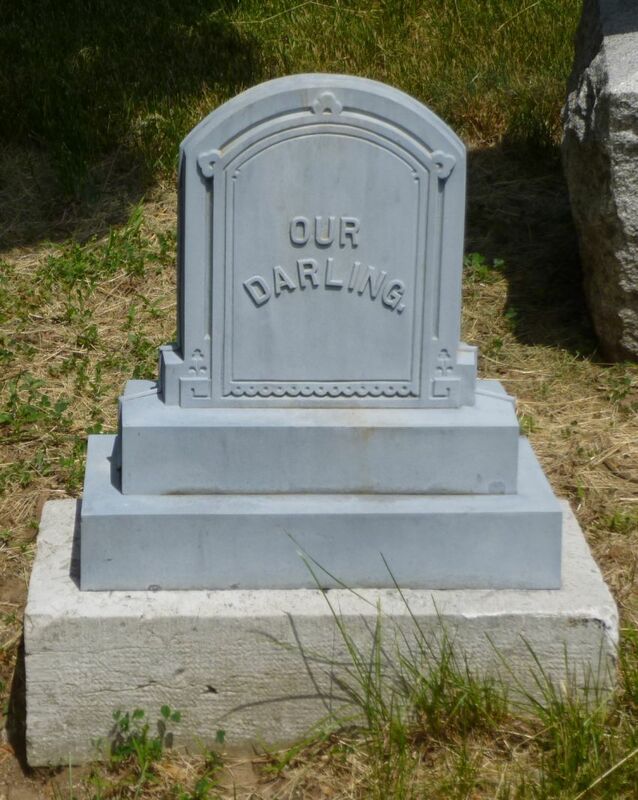 Nice to hear from you and I would love to have some photo copies of the zink monuments you mentioned. 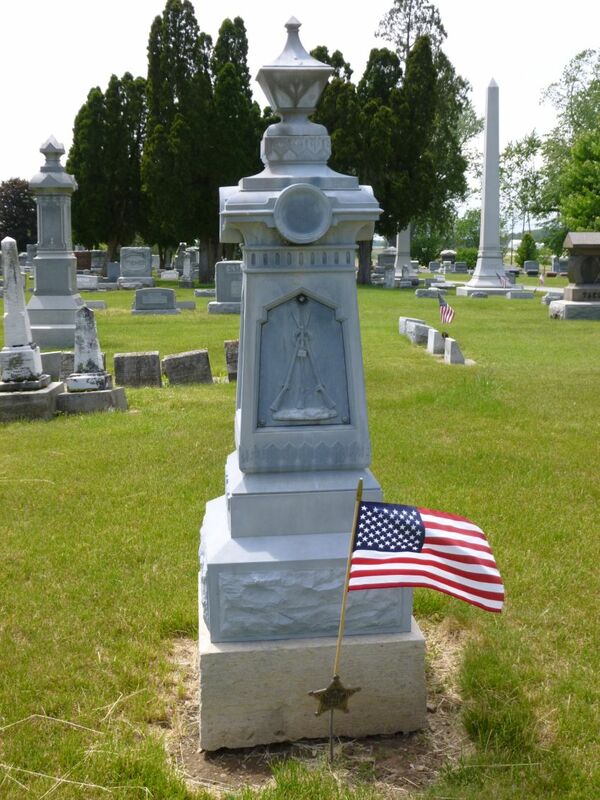 I have seen many zink monuments used for Civil War graves but I do not know if any GAR groups purchased any for battlefields. Yes, unfortunately marble monuments have not weathered well. Granite seems to hold up much better and the zink markers have held up very well, too. Thanks for writing! I do not know of anyone making the zinc monuments anymore. You could try an Internet search to see if any company makes specialty markers made of metal. They are certainly beautiful markers. 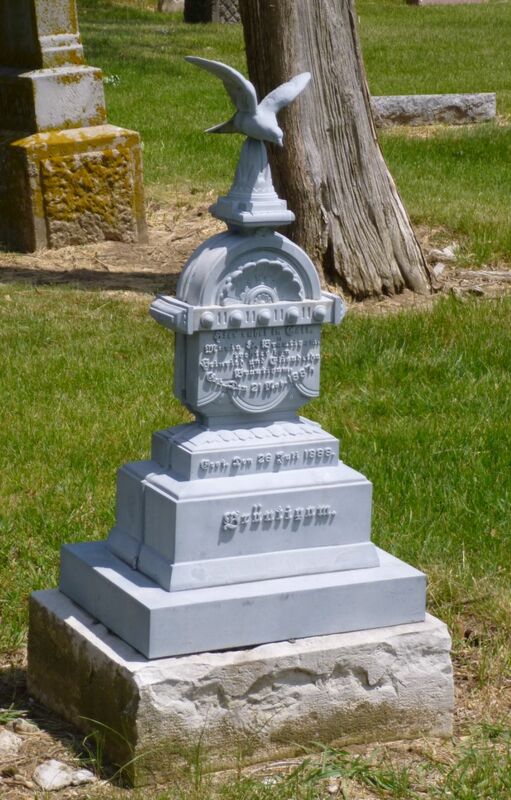 Did you find anything out about companies currently making zinc monuments? I have been trying all day to find some information online and have come up with nothing. Even if I could find somewhere that would make “faceplates” or something that could be attached to a bench type monument would be fine.